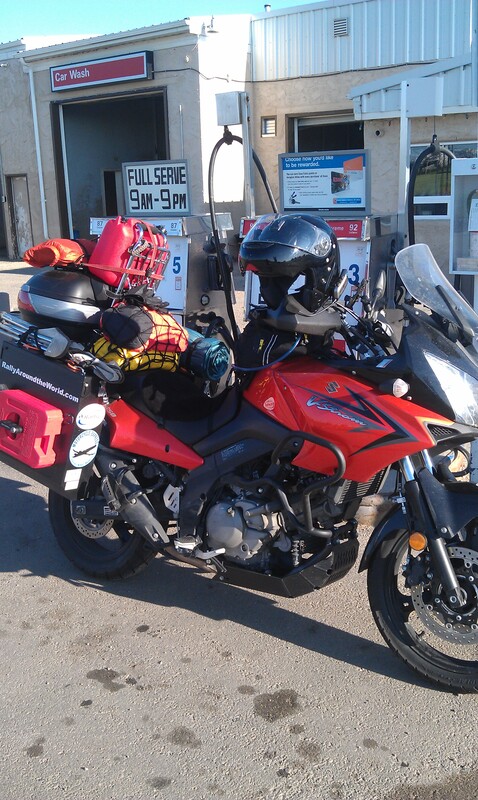 Friday, 3 August 2012 Edmonton, AB to Fort Nelson, BC Canada (654 miles) Total Trip Miles – 3052. 11 hour riding time. Weather – Cool with temperatures in the mid 50’s to upper mid 70’s with moderate winds and mostly sunny. Decided to buy a 2 gallon gas can and not use the two saddle tanks until Russia – just don’t want any issues with the airlines no allowing me to check as baggage once they have had gasoline in them. On the Alaska Highway fuel stops along the route are limited and having a spare can of gas provides me with some added piece of mind. About a third of the roadway today way a 4-lane and for the most part I was able to maintain the speed limit…once on 2-lanes there were a number of slow downs since the Alaska Highway has quite a few trucks traveling in both directions. Also, ran into several areas under construction that were gravel and, in once instance, I rounded a curve and was unable to slow before crossing a 200 foot long section that completely caught me by surprise. So far, cell coverage has remained pretty good despite what I discovered researching my global coverage…hope it continues. Arrived at the beginning of the Alaska Highway in Dawson Creek, BC…the last time I was there was May, 1973 with my family as we were movng up to Fairbanks, AK to live…back then the road was all gravel and was challenging at best with large trucks passing and showering you with rocks and dust – my Dad stopped in Dawson Creek to construct a huge screen on the front of our vehicle to protect the windshield from damage – crazy stuff!…today the new road is paved and does not have the old “Mileposts” that were so important to finding fuel, places to stay the night and restaurants & other services. The US Army constructed the highway, known as the ALCAN, in 1942 to provide strategic access from the lower 48 states to Alaska resulting from the war in the Pacific and the Japanese threat to the Aleutians and the west coast. There were actually some veterans of that construction in Dawson Creek to commerate construction of the highway. The bike is covered with mud, dust and insects from the last 3000 miles of virtually any summer weather…the gravel sections of the Alaska Highway were so dusty today, vehicles were required to burn headlights. 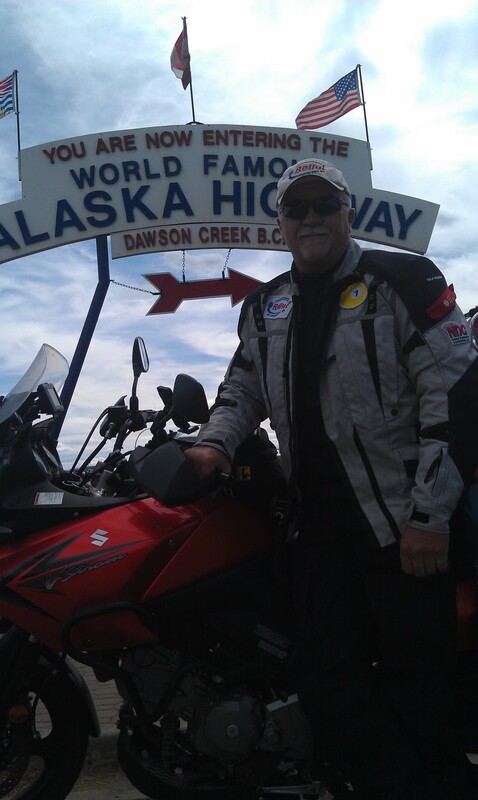 This entry was posted in Rally Around the World, Route, Uncategorized and tagged Alaska Highway, ALCAN Highway, Dawson Creek by rallyaroundtheworld. Bookmark the permalink.